Money doesn't grow on trees but people all too often throw it away. I'm not talking about leaving the lights on or letting the water run when you brush your teeth. I am talking about on trash day. People are very frivolous when they purchase something new and they often just throw away the old item regardless of its value or use. Not me! My LeeEllen and I often drive around on trash day and look to see what people are discarding. We don't call it trash diving like some do. We call it curb shopping. Well yesterday my friend Amber was over working on my Cricut. At one point I went outside to see my neighbor was throwing away 3 older bikes that need basic repair. I went and knocked on their door, confirmed they were throwing them away. (Something I don't do if I don't know the person) They confirmed their trash status and Amber and I rolled them to my backyard. I then called LeeEllen too let her know of the score because we had been looking for bikes on craigslist. As if that isn't awesome enough... I had just got done telling Amber about how my backdoor's double pane glass is currently only a single pane and when we were driving back from a quick grocery shopping trip (where I saved $40 using coupons off a $100 bill!!!) and someone had my backdoor laying on the curb! So Amber asked if I want to go back and look at it.... yes! So we do, and the glass is in good shape so we loaded it up and brought it home. When the glass was broken in my backdoor my mom priced a new grid and glass piece and the store wanted $250 for it! I found it for FREE on the curb. 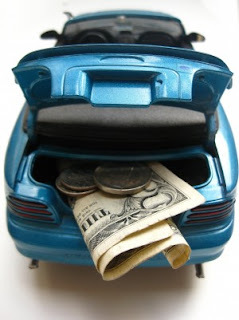 I felt like I was loading money into Amber's trunk like the picture. For those of you who still think it is below you or it is trash diving... here are some other things we have picked up over time. ::three chairs that roll and are in great shape and make the perfect sitting area in my back room. :: a glass top table that sits between two of those chairs. That's right... a pool table! just needs new felt! LeeEllen scored that... and the lady even gave her the cues and the balls! So we find money all the time just laying around. I will post pictures of some of my finds another day. Happy Monday. My sister Brooke comes in tomorrow!